French Emblems: Emblem: Malo oppressus, deterius formidat. When one is oppressed by something bad, one fears something worse. Incurvis aquilae permetuit carpier unguibus. Afflictus: capiti is rite suo consulit & rei. The little dove, cooped up and enclosed behind bars in her cage, Is terrified of being caught in the eagle’s curved talons. An afflicted creature fears a worse danger in its anxious mind: it is justifiably concerned about its life, and about the thing itself. Nullam, Vare, sacra vite priùs severis arborem. 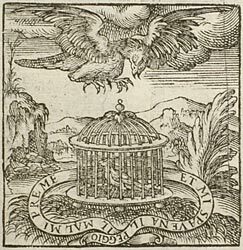 A dove is to be portrayed, shut in a cage, with, above, an eagle flying all about it, threatening it and trying to attack it. There could also be inscribed, both on the top and bottom strip of the cage, be inscribed this little verse: IL MAL ME PREME, ET ME SPAVENTA IL PEGGIO (‘Evil oppresses me, and yet I am afraid of something [even] worse’). The emblem aptly describes the dire straits of the innocent, whose lowliness and straitened circumstances are no protection against the thousand [p.129] tribulations which beset them in the form of fraudsters and the predatory sort of men. 1. Odes, 1.18. Varus is perhaps the same as the critic Quintilius Varus, whose death Horace deplores in Odes, 1.24.